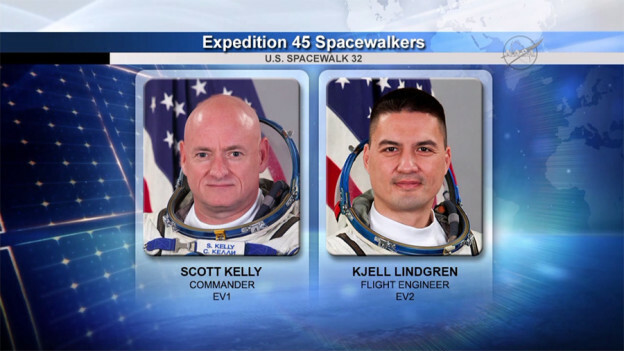 NASA astronauts Scott Kelly and Kjell Lindgren ended their spacewalk at 3:19 p.m. EDT with the repressurization of the U.S. Quest airlock, having completed most of the major tasks planned for their excursion outside the International Space Station. Kelly and Lindgren applied a thermal cover on the Alpha Magnetic Spectrometer; applied grease to a number of components in one of the latching ends of the Canadarm2 robotic arm; and began work to rig power and data system cables for the future installation of a docking port to the station that will be used for the arrival of the Boeing Starliner CST-100 and SpaceX Crew Dragon spacecraft. Greasing numerous parts of the robotic arm took somewhat longer than anticipated, and flight controllers chose to forego the lubrication of one component. However, engineers are satisfied the work that was completed sufficiently enhances the performance of the latching end effector. A lower priority task to reinstall a valve on the station will be assigned to crew members during a future spacewalk. The 7-hour and 16-minute spacewalk was a first for both astronauts. Crew members have now spent a total of 1,184 hours and 16 minutes conducting space station assembly and maintenance during 189 spacewalks. Kelly and Lindgren will venture outside the International Space Station again on Friday, Nov. 6. The two spacewalks were scheduled around milestones in space. Tomorrow, Kelly becomes the U.S. astronaut who has lived in space the longest during a single U.S. spaceflight, and Monday the crew celebrates the 15th year of a continuous human presence in space aboard the station. During the second spacewalk, the astronauts will restore a truss cooling system to its original configuration following a 2012 spacewalk in which another team of astronauts attempted to isolate a leak of ammonia coolant. They also will top off ammonia on the station’s truss reservoirs. NASA Television coverage will begin at 5:45 a.m. EST ahead of the spacewalk’s planned start time of 7:10 a.m. I watched the majority of the spacewalk today, live on NASA TV. I can only imagine how tired, hungry and in pain the Astronauts had to be, by the time it was over. I thought the woman, I forgot her name, telling Scott to wipe his grease gun inside the ‘wipe’, instead of turning it inside out and using it more easily, was being way too picky and bossy. For one thing, anyone who has ever used a grease gun, would have known that wiping it off inside of something that doesn’t open up very wide and also being something you can’t see into, would result in a big mess – which it did. Not only that; it took so much longer to do a simple task, made harder by her, it was really irritating to see it happening. I know, Scott has a lot of patience, more than I would have, especially after all those hours of working outside of the ISS. I realize they have procedures for a reason, but this was counter-productive and unnecessary. All he had to do, when using it his way, was to roll it up after use. Her way, slowed him down and caused a mess. They should redesign the ‘wipes’, or let the astronauts use them the way they find the easiest. There were other things that were hard for them to do, but not unnecessarily so. I wonder just how much pain those guys were in, especially Scott since he had the much harder tasks. Tasks where the pressure on his hand and fingers must have been enormous. All in all, a very successful spacewalk, over the period of 7 hours and 16 minutes. Thank you to Scott and Kjell, for doing a fantastic job! Congratulations to Commander Kelly and all the crews,past and present and all the great support teams around the world. Congratulations! I know those are incredibly difficult to pull off. I find the ISS to be incredible and all of its achievements. Anyway, congratulations on your EVA!